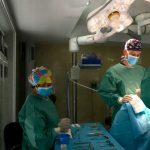 If you are beginning transition, it may be a good idea to begin taking standardized FFS surgery photos for many reasons. They are handy to track HRT progress, which affects soft tissues significantly–sometimes enough to modify a facial gender surgery treatment plan. They will be a good base for a historical review as you progress with other treatments too, like hair removal, weight loss, or micro-pigmentation. However, you will need to establish a few control factors so that these photos may actually be a good base for comparison. 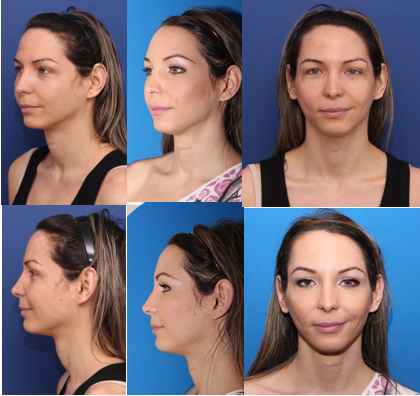 The angles seen in the photos above are ideal for before and after surgery, in order to make the most objective assessment possible of your results. Before surgery, this kind of photo, with good lighting/no shadows, hair back, no glasses etc is ideal for your records, doctor evaluations or digital simulations and more. This is definitely too close to the camera! Problem 1: too much makeup in the postop photos. Ideally, the before and after images should be identical in all ways possible. So, if there is a little makeup before, it is best to apply the same makeup when doing the comparison photo postop. Of course, clinically it is best to analyze surgical outcomes without any makeup at all in any photos. Problem 2: slight smile. Although in both photos this patient seems to maintain the same slight smile, so the conditions are the same, even better would be without any expression. As if lost in thought or daydreaming, with the facial muscles all relaxed. A precise description of what you would like to change with FFS. Three photos: frontal, profile and 3/4 lateral (or 45 º), such as in the example at the bottom of the page. Your full name and surname, country of residence, contact telephone and Skype username. Couldn’t have said it better myself! 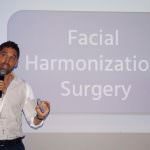 Join this group to learn much more about facial feminisation surgery. Don’t hold the camera yourself and try not to use mirrors. Keep the camera at least 6 feet (2 metres) away from your face. The pictures should be well lit and in focus, but not in direct spotlights or sun that causes contrast and shadows. Make-up: It’s fine to wear light make-up, but avoid heavy eyeliner or eye-shadows. Keep a blank, relaxed expression, without a smile. As if daydreaming. It is best to turn your whole body to get the different angles rather than just turning your head. Keep your hair completely pulled straight back and off your face. In summary, try to standardize every factor in your FFS Surgery photos so they may be more adequate for later comparison of your transition progress and surgical results. The same spot in your house is perfect, with identical lighting, expression (or lack thereof), makeup, and distance from the camera (on a tripod or table). It may take extra effort but in the long-run you may find them absolutely essential when assessing the effects of the changes along each stage of your journey.